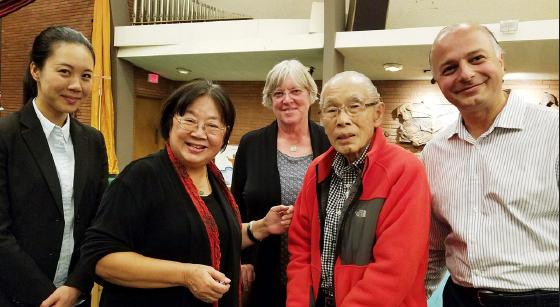 Beyond Baroque, in coordination with the Venice Japanese American Memorial Monument Committee, will present on Saturday, May 26, from 2 to 4 p.m. an afternoon of music and poetry, a documentary film, and a panel discussion on the forced removal and incarceration of persons of Japanese ancestry during World War II. The program will begin with a 15-minute performance of Deon Nielson Price’s composition for mixed media, “Behind Barbed Wire.” Pianist Mary Au and saxophonist Chika Inouye will perform as well as read haiku in English translation, written by incarcerees of assembly centers and the American concentration camps. Behind the musicians will be silent video images of life for Japanese Americans imprisoned behind barbed wire, bookended by footage of Imperial Japan’s attack on Pearl Harbor on Dec. 7, 1941 and of the U.S. atomic bombing of Hiroshima on Aug. 6, 1945, symbols of the beginning and the end of World War II for the U.S.
Next, a new film, “And Then They Came For Us,” will be screened. Award-winning filmmaker Abby Ginzburg and her co-director and editor Ken Schneider produced this 50-minute documentary, which features interviews with former internees, including actor and activist George Takei. Takei and his family first faced imprisonment at the War Relocation Authority camp in Rohwer, Ark. After his parents declined to answer Questions 27 and 28 on the “loyalty questionnaire” in the affirmative, however, the Takeis were sent to what became the Tule Lake Segregation Center for potentially dangerously disloyal persons of Japanese ancestry. Takei was seven years old at the time. The Civil Liberties Act of 1988, signed 30 years ago by President Ronald Reagan, attributed the government’s actions following Executive Order 9066 to “race prejudice, war hysteria, and a failure of political leadership” as opposed to legitimate security reasons. For reservations, contact Phyllis Hayashibara at [email protected] or call (310) 390-1576. General admission $10 general, $6 for students, seniors, and children, free for Beyond Baroque members. Seating will be limited to 100 persons in the intimate Beyond Baroque theater. Located at 681 Venice Blvd. in Venice, Beyond Baroque is one of the leading independent Literary Arts Centers dedicated to expanding public knowledge of poetry, literature and art. For more information, call (310) 822-3006 or visit www.beyondbaroque.org.